I love Asian soups, even when I was a child I enjoyed trying all the noodle soups at our local Chinese restaurant. Well, my love affair with these light and healthy soups continues, and I would eat a noodle soup at least every day for either breakfast, lunch or dinner. 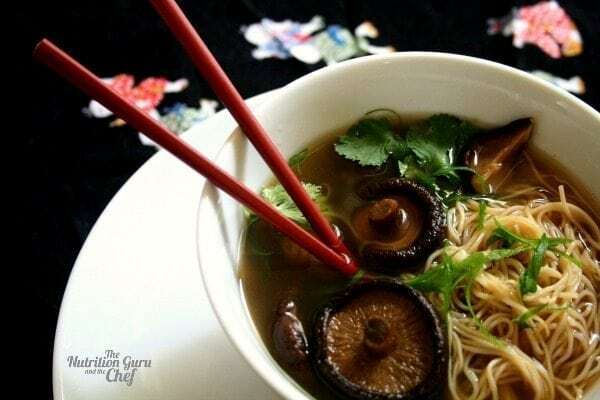 Here I will show you the nutritional benefits of my favourite Shiitake and Ginger broth, provide you with a very simple recipe, and also fill you in on some of the concoctions you might want to experiment with. Shiitake Mushrooms have long been a symbol of longevity and used widely in chinese medicine and cuisine. High in iron, six different minerals, Vitamins B2 B3 B5 and B6, they are also a good source of protein and fibre. Research shows that they may strengthen the immune system, protect the heart and possibly prevent cancer. The are also high in naturally occurring MSG which gives them the ‘Umami’ flavour. Umami is one of the six flavours found in food and one which our brain naturally seeks out and craves. In Japanese, it translates to ;savoury deliciousness’ which is the most fabulous phrase because it is exactly what shiitake taste like. 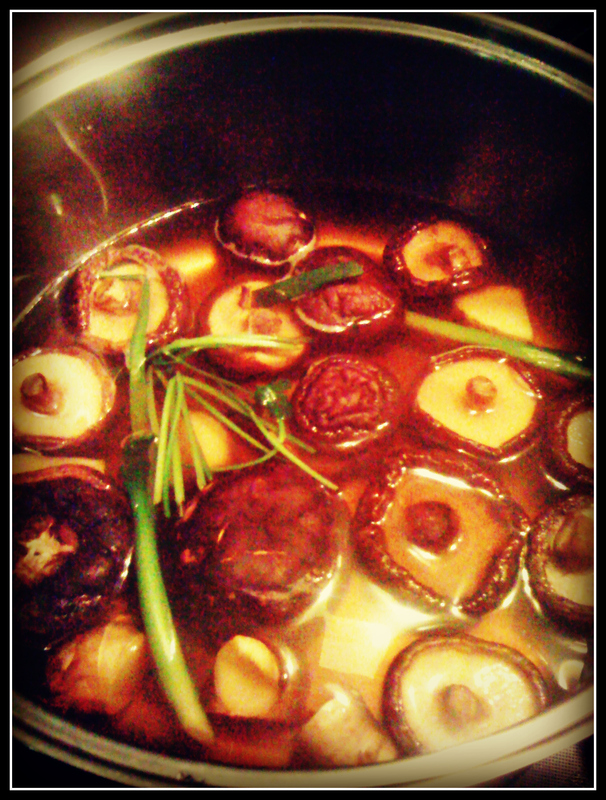 So what better way to eat shiitake mushrooms, that to make a healthful tasty broth. The recipe also contains garlic and ginger which also have fabulous health benefits. Ginger: Has been used traditionally to soothe digestive complaints, stimulate digestion and reduce nausea. There is some research suggesting that it may hold the ability to prevent cancer and boost the immune system. Garlic: Anti-inflammatory, anti-microbial and anti-oxidant benefits. 1 large knob ginger (approximately 20 cm x 2 cm) peeled and chopped into thumb-sized pieces. It’s as simple as throwing it all in a large saucepan. Boil with the lid on for 3 minutes or until shiitake mushrooms are soft yet still have slight firmness to them. You can strain the soup, or eat as is. I like to remove the shiitake mushrooms, slice and then add back into the pot. This can be served as a soup on its own, or it can be frozen and will store very easily. It can also be used as a stock for poaching chicken, making risotto’s or stir frying meat. Cook your choice of noodles, drain and set aside. A good source of carbohydrates for energy, and low in fat (look for a noodle with less than 2 grams of fat per 100 grams). Lay noodles in the bottom of a bowl, ladle hot soup over the top. Add sliced roasted meat from the night before, or poach your choice of meat in the hot broth until cooked through. 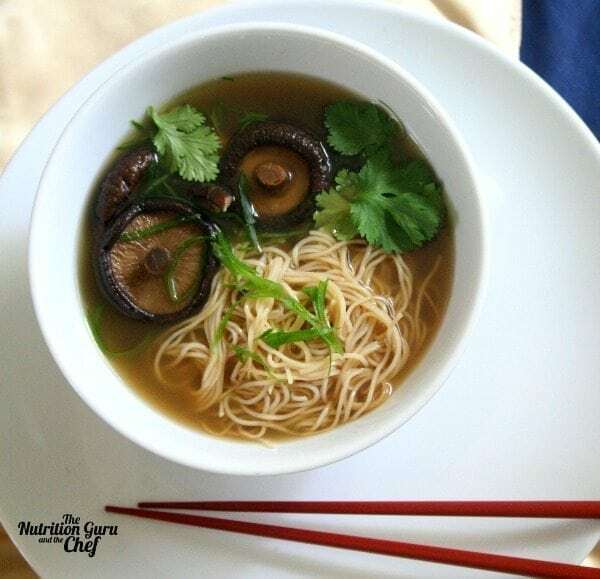 See our other recipes under ‘savoury dishes’ for which you could substitute chicken stock, for this delicious shiitake broth. The possibilities really are endless and that’s the magic of this very simple dish. I adore Asian broth soups. I love to add tamari, ginger and shiitake mushrooms too – but also often add some soft tofu, sliced seaweed, chilli, garlic, and konnyaku (shirataki) noodles, broccolini, sum choy/bok choy etc….the more greens the better! I also love soba noodles (cooked from dry, not the pre-packaged). Sometimes I add green beans or fresh soy beans. Heart! xo. All those additions sound yum, yum, and more yum! We are coming over to your place for soup from now on! Check out our other soup recipes too! >thanks for stopping by and leaving a comment! I will definitely check out your other recipes 🙂 I’ve already had a look at a few and marked some I need to make! I also make an awesome lentil and veg soup seasoned with cumin and caraway and other spices. Mmmmmm. xo. Sounds like you are definately the soup Queen Nataly! Hehe. Thanks 🙂 But I bet both of you guys could make a totally awesome version that craps all over mine 😉 xo. Loved it! Made it tonight for dinner. I poached some pork strips in the broth and served with soba noodles and baby spinach leaves. Plenty for dinner for 2 plus leftovers for freezing. Oh wow! Thanks for letting us know, glad you enjoyed it! yum! just made this but used oyster mushies instead of shitake – so delish! Oh wonderful! That would have definitely been delicious, we just love oyster mushrooms!